ASF Housing Scheme is a first ever commercial venture of ASF Foundation. It is a joint venture project of ASF and King’s Group. It offers low cost housing solution while maintaining high development standards in its housing scheme “ASF City” located on Super Highway. ASF foundation has employed a team of professional architects and town planners to develop a state-of-the-art housing facility in Karachi. Note: bookings are closed now, and all properties are available on resale in the market. 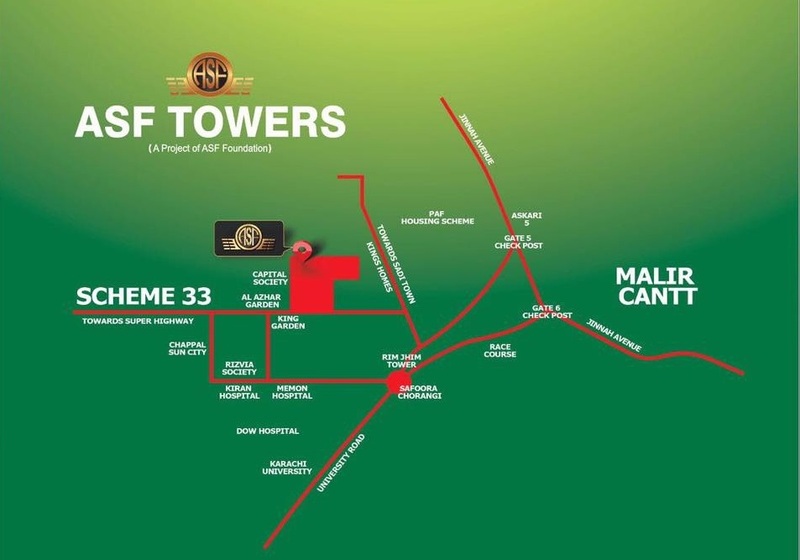 ASF Housing Scheme offers residential plots and bungalows in its scheme ASF City Karachi located on Super Highway, and luxury apartments in ASF Towers near Malir Cantt. Gate no. 5. 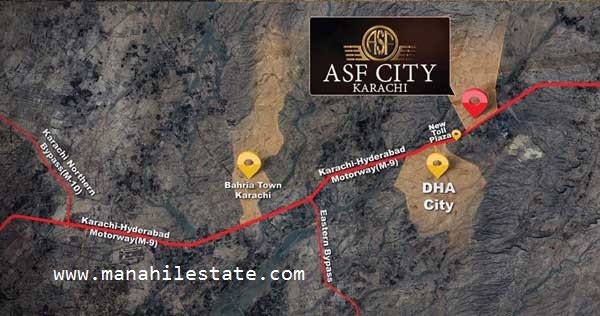 As we can see on the location map, ASF City is located near DHA City Karachi on Super Highway. The location seems to be very far from the main city, however if we look ahead 10 to 20 years in future, we will see many more developments in this area because of the two major housing developments in its neighborhood i.e. DHA City and Bahria Town Karachi. The location of apartments is quite appealing as many other residential projects are being developed in this area near Safoora Chowrangi. High speed lifts for apartments. Each apartment is corner apartment. 24 hours security with boundary wall, security gaurds and CCTV monitoring. 24 hours availability of water, gas and electricity. 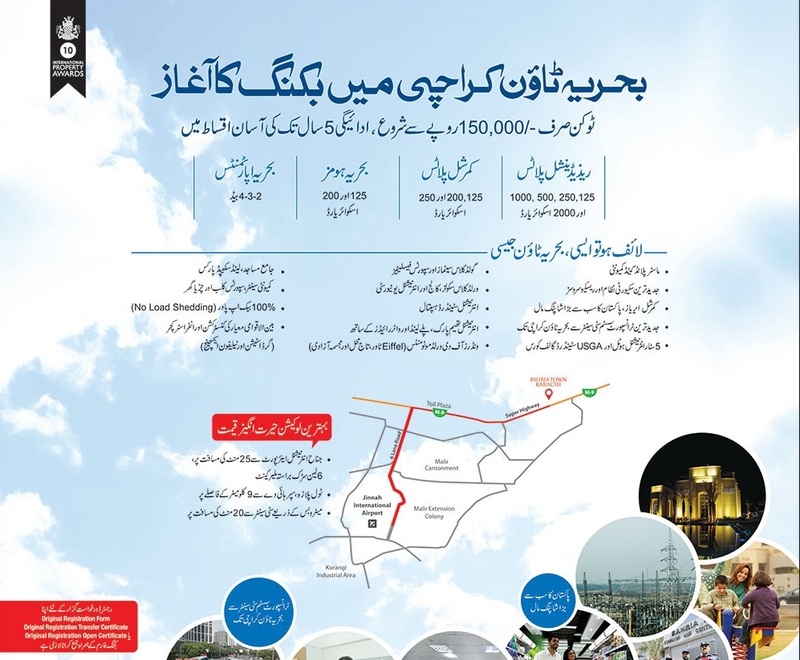 As you can see in the above listed price plans, ASF Housing Scheme Karachi offers 5 years easy installment plan for residential plots and bungalows, and 3 years installments with loan facility for apartments. 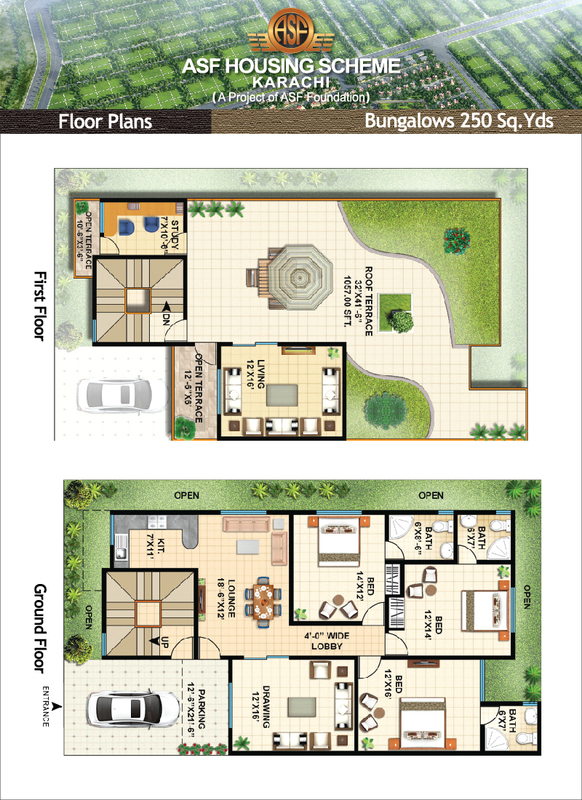 Large number of bookings were done recently in plots, apartments and banglows recently as thousands of people applied in this project for investment as well as for future residence. Balloting for plots and bungalows was held on 31st March 2017 and the ballot result can be checked on its website by entering registration number. If you are looking to buy some property at low price with easy and flexible installment plan for future residence, ASF Housing Scheme Karachi can be considered as one of the best property options to serve your purpose with safety of your investment and promising future.